Thoughts from Polly's Granddaughter: When Is An Elopement Not An Elopement? When Elizabeth Warren says it's one, apparently. Many of us have repeatedly heard the “my parents were so in love…..blah, blah, blah….they had to elope…” story from Elizabeth Warren and we are not buying it. The team and I took the liberty of researching her parents, their marriage, the minister, and the Herring family. Ms. Warren’s story does not make sense. 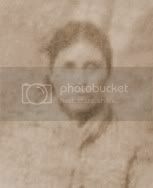 We wonder if Ms. Warren hasn’t taken a type of marriage ceremony that was common during the Great Depression and changed it to an elopement for the sake of trying to prove her claim of Cherokee ancestry. What exactly does she mean by “elope”? To most of us, eloping means a couple sneaks off to a distant place, applies for a license, requests that license is not posted in the paper, gets married quickly by a Justice of the Peace and then stays away, at least long enough to consummate their marriage. We don’t expect an elopement to mean a couple goes to a town about 19 miles away, applies for a license, goes to a prominent minister of their same faith, takes a good friend from high school to be the witness, and then hurries back home to proudly tell all their friends about the marriage. We don’t expect an elopement to include a big announcement in the paper celebrating the marriage nor do we expect a wealthy aunt to just happen to be in town during and after the marriage takes place. 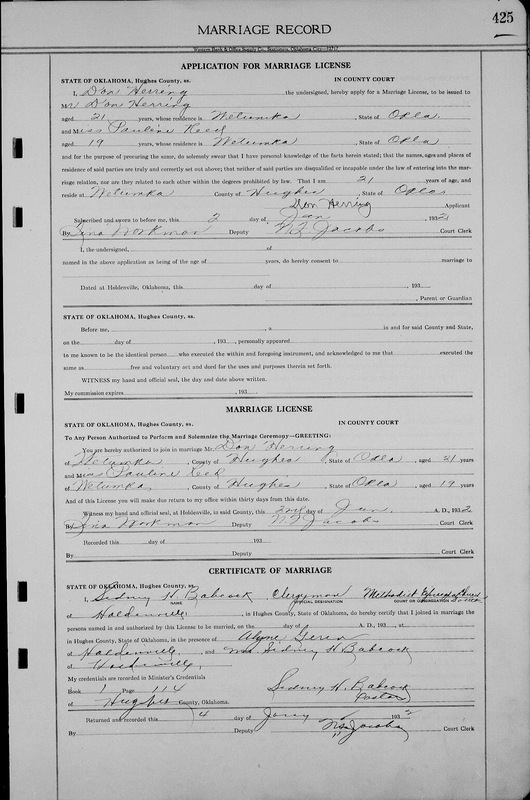 From the marriage license that was filed in Hughes County, Oklahoma, we know that Pauline Reed and Donald Herring, the parents of Ms. Warren, obtained a license and got married on the same day, January 2, 1932. The ceremony was performed by Reverend Sidney H. Babcock and it took place in Holdenville, Oklahoma. The ceremony was witnessed by Alyne Geren. Who was this Alyne Geren who witnessed the marriage? Apparently she was a friend of Pauline Reed, Ms. Warren’s mother. 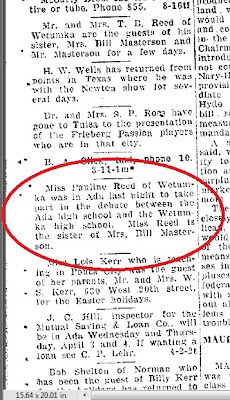 According to the Ada Evening News; April 3, 1929; Alyne attended a debate where Pauline competed. Donald Herring, father of Ms. Warren, attended the same debate. 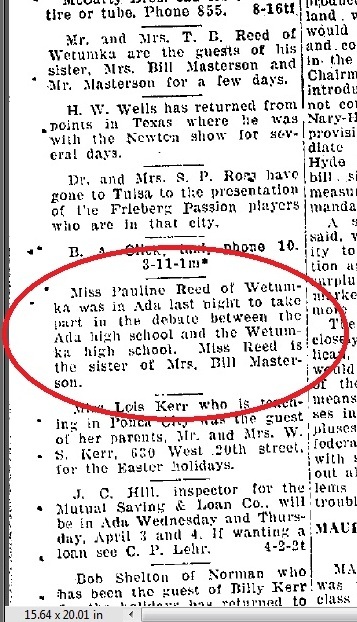 Pauline’s sister, Maxine Masterson, lived in Ada, and there were often snippets in the society column about her, her family, and her visitors. Every high school student that attended the debate was not mentioned but Pauline, Donald and Alyne were. 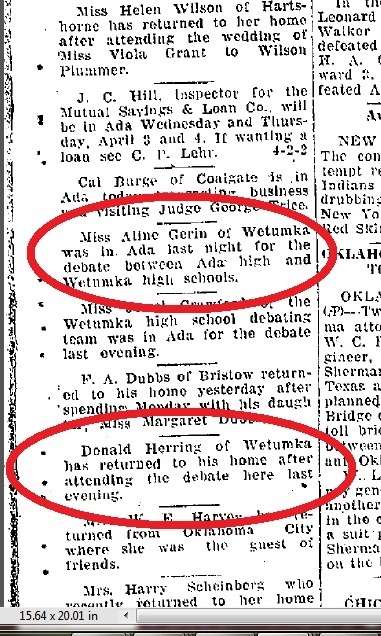 Since we already know Pauline and Donald later married and that Alyne was their witness, it is not a stretch to assume these three were good friends while in high school and that both Donald and Alyne attended the debate to watch Pauline. It is also not a stretch to assume Donald and Pauline did not have to hide their relationship from his purportedly racist parents since his attendance at her debate was published in the newspaper. Ada Evening News; Ada, Oklahoma; Wednesday, April 3, 1929; page 3, column 1. Why did the parents of Ms. Warren get married when they did? Does that give any clues to the validity of her “elopement story?” They got married January 2, 1932. This was about 2 months after her father turned 21. Both Donald and Pauline were also home on winter break from college. These are pretty significant facts. The law at that time required a man get signed parental permission to marry if he was under the age of 21. Ms. Warren says after fighting it as long as they could, her parents went off and eloped. Really? Her father could only legally marry for two months prior to his marriage. Is it possible that Donald’s parents simply refused to give their permission for him to marry before he was of legal age? Or could they have opposed a marriage, any marriage, at that time because they wanted him to finish college? According to the marriage announcement that appeared in the Wetumka Gazette, he was attending what was then A & M (now Oklahoma State University) in Stillwater and he was studying engineering. According to the 1940 US Census, Donald only completed two years of college. Maybe his parents feared if he got married, he would drop out of college. And according to the evidence, that is exactly what happened. If Ms. Warren’s parents eloped due to her mother being “Cherokee and Delaware” and it was such a disgrace, why did they rush back to Wetumka the same day they were married and proudly announce it to everyone? If there was shame associated with the marriage and it caused so many problems, why was it happily announced in the local paper and why did the town seem to celebrate the marriage of the two popular young people? Though a surprise to their friends, the excitement and happiness that seemed to show in the announcement makes one think it may have been a small ceremony typical during the Great Depression. Wetumka Gazette; Wetumka, Oklahoma; Friday, January 8, 1932; page 1; column 5. There is also one other fact worth noting. 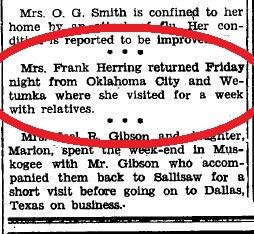 Mrs. Frank S. Herring, aunt of Donald, was visiting in Oklahoma City and Wetumka during the week of the marriage. 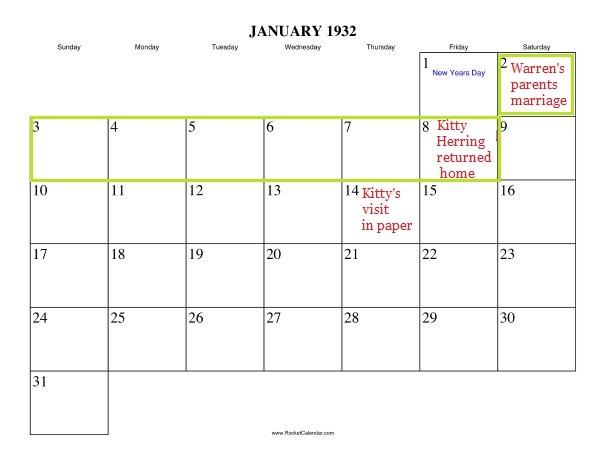 There is no mention of the reason for her visit at that particular time or on those specific days, but in light of the marriage date of Ms. Warren's parents, it makes one wonder if Kitty wasn’t there for either a wedding shower or a reception that might have occurred after the wedding. Because she arrived in the area on about January 2nd, it makes one think the family might have been aware that a marriage was taking place. The Democrat-American; Sallisaw, Oklahoma; Thursday, January 14, 1932; page 5; column 2. We have all heard Ms. Warren’s oh so sad story of her parents’ marriage. After looking at the information available from a variety of sources, it seems there could be reason to doubt what she says about her "Cherokee-ness" AGAIN. This marriage does not look like an elopement. It looks very much like a Depression era marriage ceremony instead. Sometimes people didn’t have a lot of money to spend on a wedding so they just obtained their license, got married and then went back home. This is what Ms. Herring’s parents did. Though a surprise to some friends, this looks like a prearranged ceremony. There are many things that suggest this – the prominent minister of their faith rather than a Justice of the Peace; they married in the same county they lived in; a close friend served as one of their witnesses; they went back home the same day they got married; and they had a big announcement in the local newspaper. 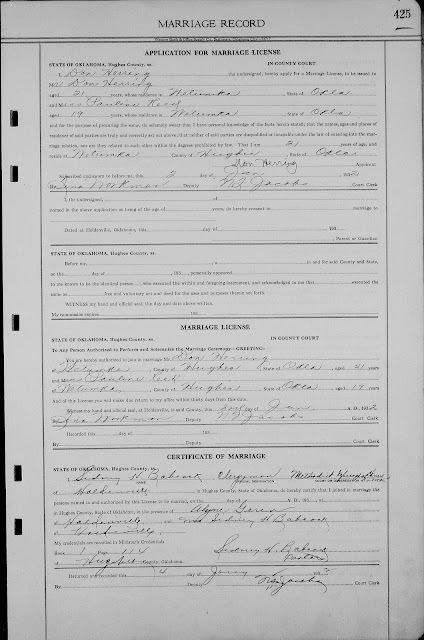 Is it possible the Herrings, Ms. Warren’s paternal grandparents opposed the marriage? Yes, of course it is, but is there any indication they opposed it due to her mother’s purportedly being Indian? No. It seems more likely they opposed to giving him permission to marry before he was the age of majority or they opposed him getting married before he finished college. But, we don’t have any proof they opposed the marriage at all. We only have Ms. Warren’s claim that they did. And we all know how well her claims to anything concerning her purported Cherokee ancestry have been standing up to scrutiny, don’t we? Stay tuned for more on this topic. We aren’t finished yet. 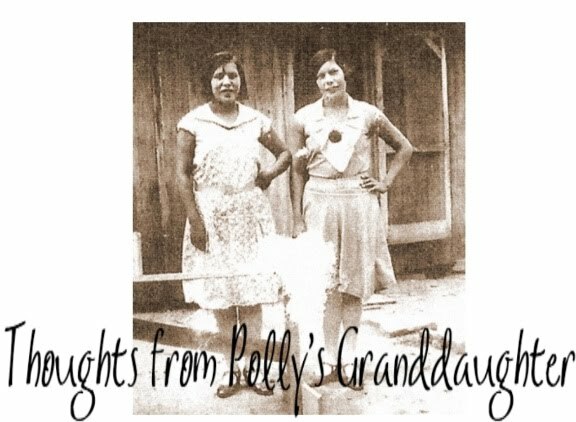 *This is part 1 in a series of 2 about the story Elizabeth Warren tells about her parents' marriage and relationship between her mother's and father's families. What a fabulous example of truly great research. Thank you for sharing your process *and* your result. I'm actually a big fan of Elizabeth Warren's -- but I'm a bigger fan of truth and critical thinking. Well done!